Adapted from the Sporty’s Academy Maneuvers and Procedures Handbook, these maneuvers guides provide step-by-step instructions on performing maneuvers required on the checkride. Each maneuver begins with simplified objectives and standards for that maneuver followed by an easy-to-follow, detailed description. An informative illustration accompanies most maneuvers so you’re able to visualize how each maneuver is to be performed prior to your flight. 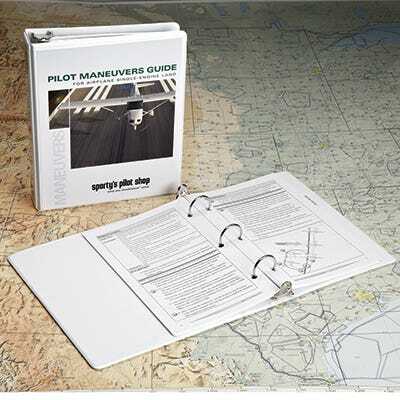 A convenient three ring binder format allows you to remove the maneuvers you need and take them with you on your next flight. Combined Recreational, Sport and Private Pilot Maneuvers Guide covers takeoffs and landings, stalls, slow flight, ground reference maneuvers, emergencies and much more. Combine titles as a CFI companion. Perfect for students and instructors. Read more about our Maneuvers Guides in this article by Sporty's Chief Flight Instructor. I needed some help getting the maneuvers down to a science , so I asked Sporty's to help get me better prepared. The first thing they asked was do you have the guide, it will help you prepare for the instructions. It is all based on the Cessna 172 and is part of their program. It is a well structured program and procedure. I would highly recommend this for students and pilots to get the best out of the lessons. Pros: Easy to protect sheets inside hard binder. Can add to the binder for future updates, etc. Glossy paper, nice touch! Cons: Currently has maneuver on two different pages. Prefer to see the subject on the front and back of the same page so you can take one page out and have all your information for a particular maneuver on one piece of paper. Would recommend to anyone. Pros: Great quick reference and easy to follow. Pros: I like the format straight forward and easy to follow. Pros: Good refresher prior to flight review. Cons: Expected larger pages. looking to add to binder. Cons: Maneuvers cover 2 pages, makes using with a kneeboard more complex. Pros: Great for students that want a convenient way of referring to maneuvers prior to an instructional flight. Cons: I would have liked to see this in larger print so I wouldn't have to use my readers. Others may find the font fine, however. 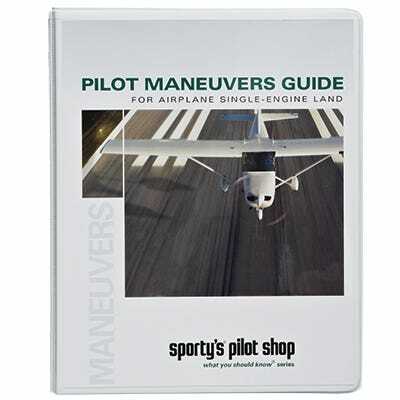 I thought that this may have been a little expensive for the content and if you are taking one of Sporty's Learn to Fly Courses, its already included as an interactive feature in the Private, Recreational, and Sport courses, so unless you want a standalone version, check your courseware first before you order. This is why I opted to say 'No' to 'Would you recommend this product?' Make sure you don't already have it first before you buy, otherwise it is useful info. Pros: Concise, well thought out Great for helping me to understand what is expected on my checkride and what the common errors are so that I don't make them! Pros: Nicely organized little binder with easy to read maneuvers guides. Perfect size to toss in a small bag. What size are the pages? Letter (11 x 8.5) or kneeboard (5.5 x 8.5)? Yes the pages fit neatly on a knee board. Is this available in PDF format or as an iPad app?